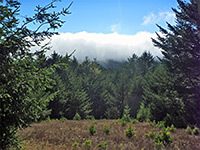 At 1,407 feet, Mount Wittenberg is the highest point in Point Reyes National Seashore, and might be expected to offer a panoramic view of the coastline, though all of the summit and the surrounding hillsides are thickly wooded so views along the steep, 1.9 mile trail that climbs the peak are very restricted, and attractions are mostly limited to the great variety of vegetation, and occasional wildlife. The path begins at the Bear Valley visitor center, the busiest place in the NRA, which is itself highly visited, the preserve being the ninth greatest in terms of the visitation for NPS units in the West, though because of the restricted views and the steepness of the route (gaining 1,320 feet), the Mount Wittenberg Trail is not often hiked, and hence offers relative solitude just a few minutes from the center. The summit can also be reached, with rather less elevation gain (570 feet) from the Sky trailhead along Limantour Road, and the Sky Trail also forms a short part of a possible loop, only slightly longer than the out and back journey along the Mount Wittenberg Trail, returning to Bear Valley via the Meadow Trail which offers slightly more varied scenery, including a large meadow half way along. 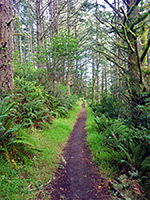 The Sky Trail also has somewhat more open views, as it runs right along the top of Inverness Ridge, and on fog-free days the ocean be clearly seen, through gaps in the trees. The loop is relatively strenuous for what might be considered little reward, especially on foggy days, when even the limited views are obscured. Wildflowers are not so numerous, found mostly in moister sections along drainages, and in the meadows. All sections of the loop are open to horses, though the Mount Wittenberg Trail is rather steep and the nearby Horse Trail to the north is a better option for riders. The Bear Valley visitor center sits in a large grassy clearing at the north end of Bear Creek, at the edge of the San Andreas Rift Zone; the complex includes ample parking, picnic/barbecue areas and a corral. Several paths start here, by far the most popular being the Bear Valley Trail which leads through wooded surrounds for 4.4 miles to the Pacific Ocean at Arch Rock, though most people just walk a much shorter distance. The route to Mount Wittenberg forks west after 0.3 miles. The Bear Valley Trail is a wide, flat vehicle track, initially crossing the grasslands bordering the visitor center, all of which are parched and dry by midsummer, then running alongside Bear Creek through dark, moist woods. The Mount Wittenberg Trail branches off to the right just after a sign marking the edge of the Phillip Burton Wilderness, still in the meadowland, and abruptly leaves the dry grass for thick forest, where it starts to climb. The initial ascent is steep, up to a ferny flat, then along a minor drainage and close to a small meadow on the right. The land is briefly flatter, before the trail bends a few times while climbing again, moving through another steep section, and round the corner of a sloping ridge, where the hills above come into view, the ridgeline still quite far ahead. 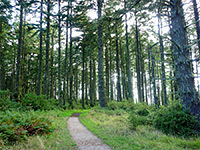 The generally moist forest gives way to a drier grove of pine trees, growing close together with no undergrowth, followed by another wetter section as the path completes its ascent, leveling out at a large, dry grass meadow entirely surrounded by trees, and reaching a five way junction, the other routes being an unofficial short cut south which links with the Meadow Trail, the continuation of the Mount Wittenberg Trail southwest, Z-Ranch Trail north and a spur to the Mount Wittenberg summit northeast. This latter path is only 0.2 miles long, ending in a little loop, but the summit is rather flat and completely forested so there are virtually no views; just a fleeting glimpse of Tomales Bay to the east. In former times the peak was largely free of trees, but a dense thicket of Douglas firs has grown following the Mt Vision Fire of 1995. The loop hike continues by returning to the five-way junction and heading southwest along the final section of the Mount Wittenberg Trail, which is a little more open, running a short distance below the ridgeline. Clear days offer views of the undulating hills below, to the west, and of the ocean beyond. This trail soon ends at a junction with the Sky Trail, which just after meets the north end of the Meadow Trail, the route back down to Bear Valley, though it is worth walking a little further south along the Sky Trail as this enters a prettier, more atmospheric section of the forest, similar in feel to some of the coastal redwoods much further north, with large, tall, often misty trees and thick, verdant vegetation on either side. The upper section of the Meadow Trail is generally straighter, moister and has a more uniform gradient than the Mount Wittenberg Trail, descending through quite thick, mossy woods for half a mile, across a wide, elongated meadow, and in woods again for the last half mile, ending by crossing Bear Creek on a footbridge and joining the main valley floor trail. The 5.1 mile loop is completed by walking north through the woods and back to the wide grassland adjoining the visitor center. The creek is shallow but flows all year, forming a few pools and minor cascades.